With the onslaught of ransomware and other cyber threats it is becoming harder for corporations to protect their data. News reports about ransomware attacks have become so commonplace that it easy to wonder if there is any good solution. At NeuShield we have taken a completely different approach to traditional security by offering data protection. Rather than trying to detect and block threats one-by-one we take a new patent pending approach that uses Mirror Shielding™ and Data Engrams™ which shield important data to prevent threats from modifying it. 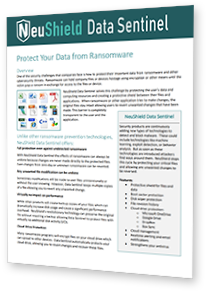 This new approach allows us to instantly recover data from any unknown or zero-day threat. Because we are protecting the data rather than trying to find specific threats, we can do this without requiring continuous updates and without signatures. With a team having built some of the top endpoint security products on the market, we have a good understanding of both the threat landscape and the weaknesses in existing security solutions. As data has become more ubiquitous the need to protect this data has become even greater. Our revolutionary technology can protect the actual data itself from attack. We hold ourselves and others to a high standard, both in the way that we work and in how we build our products. The outcome is a solution that can be trusted and relayed on for superior data protection.